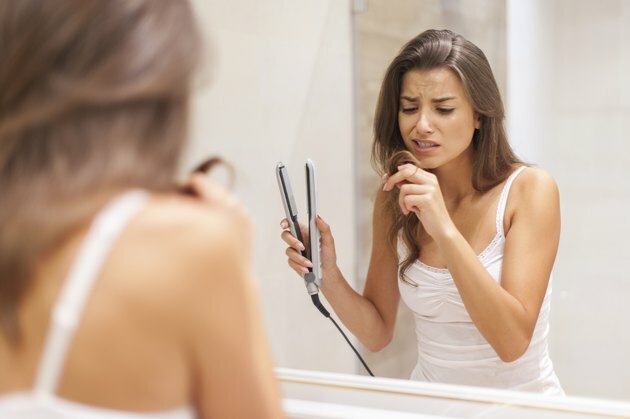 According to Natural News, because hair is made up of protein, fat, water and carbohydrates, a protein deficiency may cause weak hair or hair loss. This can be especially true for vegetarians. Adding protein to your diet may help to enrich the health of your hair. Protein powder shakes are a simple and quick way to do that. A nutrient-rich diet full of fresh fruits and vegetables can also support healthy hair, along with herbal and vitamin supplements. If you are concerned about your hair and are experiencing any unusual symptoms such as large amounts of hair loss, contact your physician. Purchase a quality protein shake mix with whole foods, vitamins and minerals that can contribute to hair health. Look for ones that contain vitamin E, amino acids and herbs. Make a shake as directed on the label. Letha Hadady suggests in her book, "Asian Health Secrets: The Complete Guide to Asian Herbal Medicine," making a shake with pineapple juice, which helped her hair considerably. Drink the shake every morning for several weeks and see if you notice results. Also try shampooing your hair with a protein-rich formula, whenever hair feels oily, or several times a week. Vitamin E may also help your hair, so you can take a supplement as directed, or add some drops to your protein shake. A spoonful of molasses into the protein shake may also help. This is a known hair remedy in Chinese medicine. A tea made of rosemary, lavender, and thyme may prevent hair from thinning. In the book, "Over 1000 Health Hints For One And All,"
Dr. Seema Kumari also suggests applying coconut oil to your hair once a week at night, then washing it out in the morning. She says avoid over brushing your hair, and use a wooden comb when you do. Avoid chemical products, such as dying your hair, when trying to regain hair health. Bathe your hair in epsom salts several times a week. Check with your doctor if you are experiencing a drastic change in your hair health or a sudden amount of hair loss. This may be indicative of a health condition that needs to be treated. Why Do Babies Try to Eat Their Hair? How Can I Thicken My Hair Naturally?